The recent accident in Westwood, MA regarding the fall of a worker clearing snow from the roof of a business, underscores just how dangerous this job can be. In this particular instance, the worker fell through a skylight and landed on the ground 25’ below. In light of the situation, OSHA has issued an advisory on snow removal urging people to review the OSHA Hazard Alert Documentation. Roof work is dangerous enough when all of your hazards are visible, but poorly protected fall hazards blanketed in snow are a recipe for disaster. Had this skylight been properly protected, this worker would not have been able to fall, but that doesn’t mean there aren’t other dangers. In the past, OSHA has responded to incidents regarding workers falling through tarp covered elevator shafts or even just sliding down a sloped roof. This is why it’s imperative to come up with safe solutions for snow clearing. This is the first question you need to ask yourself and, undoubtedly, in many situations the answer is yes, it is necessary. Reasons usually range from emergency roof repair and maintenance to the prevention of overloading and collapse. If it is not necessary, wait, but if it is, then find the best way to do it. Is It Necessary To Go ON The Roof? There are many ways to perform snow clearing. Shoveling from the roof itself might be the most dangerous. If your concern is that the roof might become overloaded, how is adding the weight of workers and equipment going to help that? Depending on the type of building you have, you may be able to utilize a snow rake. These long-handled devices give the user the opportunity to clear a roof from the ground or from an aerial lift. These rakes should NOT be used while standing on a ladder. The movement and length of the rake could cause you to lose your balance. As always, with any long-handled tool, be aware of surrounding electrical hazards and stay the necessary distance away. If It IS Necessary, What Fall Hazards Might Be Encountered? No worker should ever enter any situation blindly. Prior to accessing a roof, they should be fully aware of what hazards they might encounter. Are there skylights? If so, are they protected? Is the roof flat or sloped? Is there a parapet high enough to act as fall protection? What is the load capacity of the roof and how close to exceeding it are you? Workers should remain off the roof until these questions are answered. 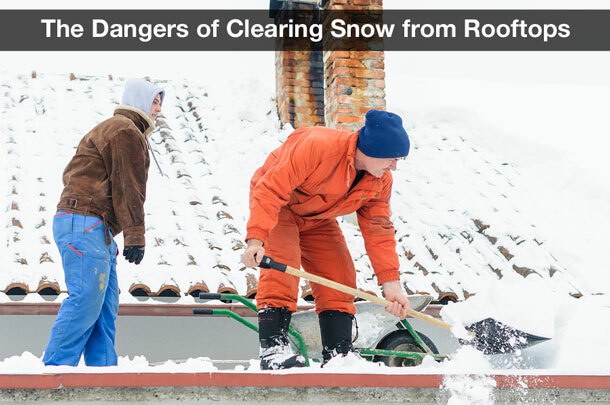 Once on the roof, they should clear off the roof uniformly, and avoid making snow piles on the roof to prevent overloading. What Needs To Be Done To Protect The Workers? Simple. There are no fewer requirements for fall protection during snow removal than during any other type of rooftop work: fall arrest systems, fall protection carts, railings, whatever it takes. Emergency situations do not give companies the right to forego regulatory compliance. In fact, emergency situations probably need closer attention to safety because of their nature: everyone is working quickly to rectify the situation. It’s understandable that if there is a concern that a roof is going to collapse that the work needs to be done quickly, but it should never be at the cost of a worker’s life. In addition, some simple planning could prevent injury and death later on. Ensuring that fall hazards are properly protected before the snow comes is critical. If a snowstorm is coming, perhaps going to the roof before it arrives to mark potential trip hazards will be of great benefit after the storm. Roof Access: If ladders are the way to go, then make sure they are inspected and set up properly, the rungs are clean, and you avoid any electrical hazards. Slips, Trips and Falls: Clear off the bottom of your boots to ensure that you get the best grip possible on ladder rungs. Also, remember that ice can be hiding underneath the snow. Walk slowly and deliberately to avoid slipping. Equipment: If using an aerial lift to perform the work, ensure that the operator is properly trained and qualified. Exposure to Cold: Train your workers on hypothermia and frostbite. Ensure that they are aware of the signs and symptoms, as well as what to do should they suspect either is occurring. Back Strains: Shoveling can lead to back muscle issues. In order to avoid this, ensure that workers are using ergonomically designed shovels, are scooping or pushing smaller amounts of snow, are using proper lifting techniques. Dehydration: People tend to forget that hard work in cold temperatures can lead to dehydration just as it does in high temperatures. Take frequent breaks and drink fluids (avoiding caffeine and, of course, alcohol). Be prepared as you would for any other weather event. Know what your plan is and work that plan. Do not take shortcuts with the well-being of your employees.